Miranda Pfieffer is HappeningsCLT’s . . .
See Miranda Pfeiffer in action! 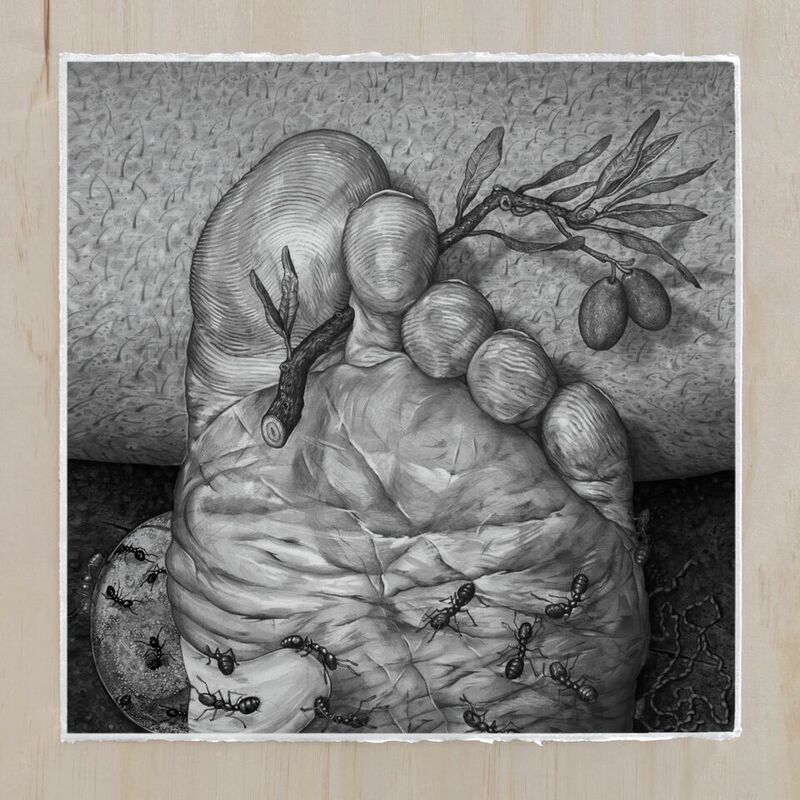 One of my first drawing instructors required his students to draw a body part in excruciating detail with the caveat that they first define for themselves the meaning of excruciating. To define excruciating – as intensely painful, mentally agonizing, very embarrassing, awkward, or tedious – is much different than putting the word into practice within the context of an individual feature, fact or item (detail). To draw in excruciating detail is to demand an image that is in sympathy with the qualities of its subject. Miranda Pfeiffer draws in excruciating detail. 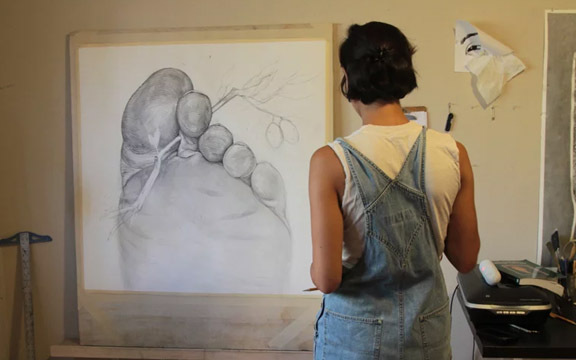 Working in mechanical pencil on paper, she has developed a distinct approach to hatching and illusionism, through which the petrified, the aqueous and the physiological are made ambiguous. Akin to a sculptural process, Pfeiffer “lingers with objects long enough to depict their minutest tendrils,” revealing their awkward or tedious likenesses. 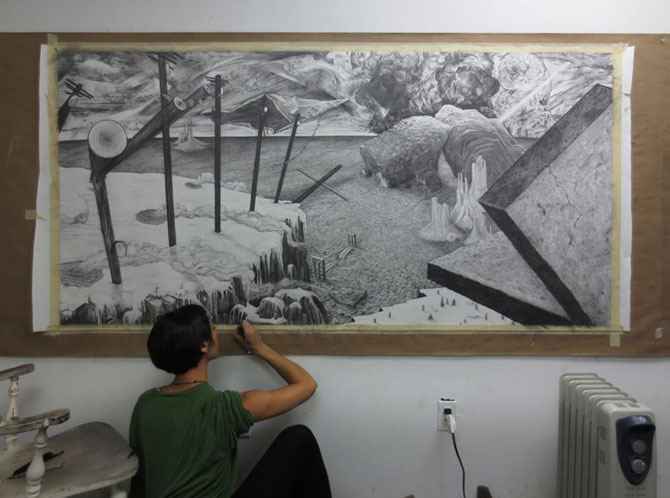 In 2011, she created Solitary Stones, a series of large panoramic drawings inspired by Chinese and sixteenth century Dutch landscape paintings. Solitary Stones constructed a world existing between an omnifarious observer and their horizon, depicted to varying degrees of generosity and austerity. The lines that delineate a stormy sky from the vast ocean below are also the axes on which they are inverted, or the gradient in which they are obscured. The world of Solitary Stones is a strange hybrid of Prehistoric and Post-Apocalyptic, where the legs of wild horses mobilize boulders, and dense glarings of cats run as wild and free as rivers amongst mountainous hills of clothing. Where the colonnades and power lines stand together in allegory – John Ford’s post-human frontier. If Solitary Stones took influence from the Chinese and Dutch landscaping traditions, these works orbit a binary star of Zen and Brutalism – which share in common stoicism, rocks, and a penchant for minimalism. Pfeiffer continues to render situations imagined and observed, changing dimensions to smaller square drawings. She shifts attention from horizon and spatial depth in favor of the immediate, the up close, and the material. By including the corner of one’s eye, the tip of one’s nose or finger, the drawings assume the immediate vantage point of a human body, depicting what can be understood in a moment of intense closeness. There are few differences between the wrinkles in Facing My Foot, and those of the pages in Drawing of a Crumpled Breughel. The compositions emulate instant-film photography; magnifying textures and patterns evoke a feeling of horror-vacui. I am too close to these images to recognize what is skin, what is paper – and when I think about it – what anything is at all. In the claustrophobia of the Rock Line drawings I do not face fantasy, but a metaphysical ambiguity. Gazing upon these drawings, dense and grey as a cinderblock wall, I experience clairvoyance and see a whole world before me. 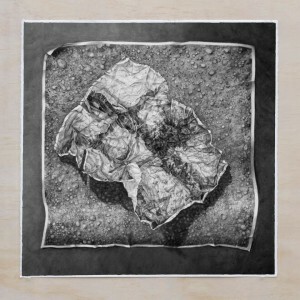 Combining drawing with digital techniques such as gif animation and fabric printing, Pfeiffer offers alternate experiences of illusionism and observation-time. The gif animations demonstrate how observation can affect or activate certain objects. The looped moment virtually brings to life those “minutest tendrils,” so that wood grain might behave as flowing water, suspending the biological in an uncanny, automated state. Through repetition, the textiles emphasize the materiality of her drawings over their illusionistic qualities. Like “magic eye” pictures, the textiles are unsparing, and require work on the part of the viewer to achieve their effect. Miranda’s obsession with mastery is indeed significant in an age marked by immaterial labor – a moment when images have become all encompassing, verging on tactility. In discussing time and mastery, she isn’t exclusively speaking to repetition, but the amount of time to become intimate, sensitive, and sensuous. 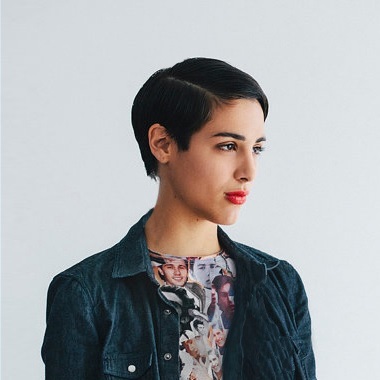 Max Guy is an artist and curator living in Chicago, IL. He has collaborated on projects such as Szechuan Best, Spiral Cinema, and Rock512Devil, a creative space for art and exhibition. In 2013, he was a recipient of the National Endowment for the Arts’ Station North Grant for the film series, Spiral Cinema, of which he is a co-founder. He is a frequent contributor to the Temporary Art Review, ACRES, and Baltimore’s What Weekly. 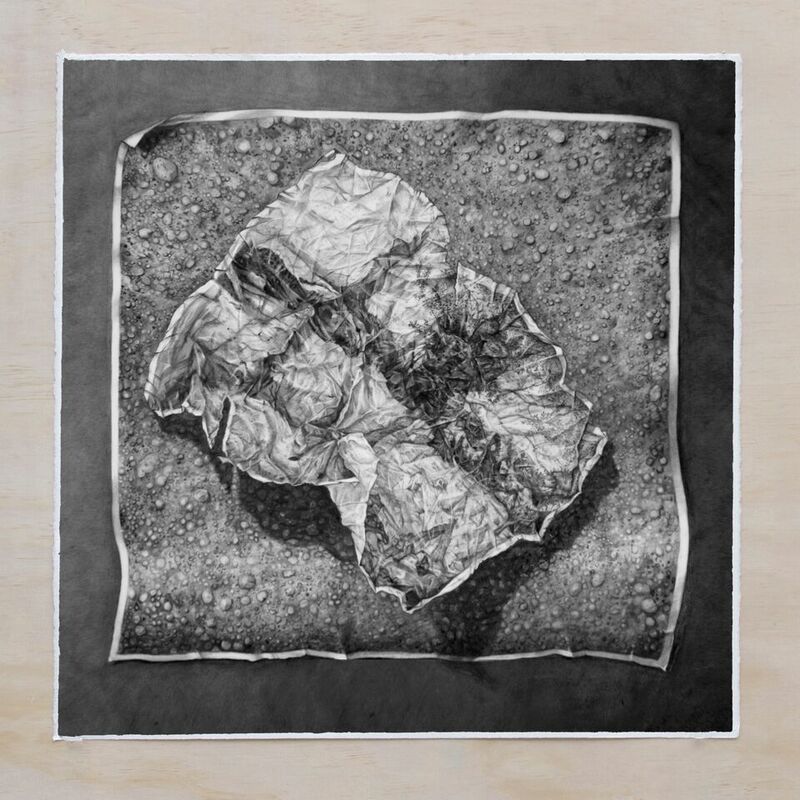 Rock Line is a collection of graphite drawings, textiles and animations that evoke natural forms through excavation and touch. In the modern era, we scroll through images on our news-feeds and snap photos before a moment has passed. Amidst the disparate spray of a technological milieu, Miranda lingers with objects long enough to depict their minutest tendrils, building massive drawings with an everyday mechanical pencil. Through representational drawings and hand drawn animation, a moment of present observation can last eternally, keeping a viewer from assuming prejudice and extending one’s sensory delight.